The word 'oath' and the phrase 'I swear' refer to a solemn vow. For those who choose not to, the alternative terms 'solemn promise' and 'I promise' are sometimes used. 13.1 General oath of office. I, (name), do solemnly and sincerely affirm and declare that I will be faithful and bear true allegiance to Her Majesty Queen Elizabeth the Second, Her heirs and successors according to law. I, (name), do swear that I will well and truly serve the people of Australia in the office of (position) and that I will be faithful and bear true allegiance to Her Majesty Queen Elizabeth the Second, Queen of Australia. So help me God! The President, Prime Minister, Chief Justice, Speaker, Ministers take their oath of office. The oath is taken in Bengali. In English, "I, (name) do swear with honor (or solemnly affirm) that I, according to the laws, shall faithfully discharge the functions of the office of the President. I shall possess pure faith and obedience to Bangladesh. I shall preserve, support and secure the constitution and I shall deal with all with equity as suggested by laws, without being affected by fear or mercy, love or hatred." In English: "I, (name) do swear with honor (or solemnly affirm) that I, according to the laws, shall faithfully discharge the functions of the office of the Speaker of the Jatiya Sangsad (and the office of the President, whenever called). I shall possess pure faith and obedience to Bangladesh. I shall preserve, support and secure the constitution and I shall deal with all with equity as suggested by laws, without being affected by fear or mercy, love or hatred." The deputy speaker takes a likely oath. "আমি (নাম), .........................................................................., প্রধান বিচারপতি (বা ক্ষেত্রমত সুপ্রীম কোর্টের আপীল/হাইকোর্ট বিভাগের বিচারক) নিযুক্ত হইয়া সশ্রদ্ধচিত্তে শপথ (বা দৃঢ়ভাবে ঘোষণা) করিতেছি যে, আমি আইন-অনুযায়ী ও বিশ্বস্থতার সহিত আমার পদের কর্তব্য পালন করিব; গণপ্রজাতন্ত্রী বাংলাদেশের সংবিধান আমি বাংলাদেশের প্রতি অকৃত্রিম বিশ্বাস ও আনুগত্য পোষণ করিবঃ আমি বাংলাদেশের সংবিধান ও আইনের রক্ষণ, সমর্থন ও নিরাপত্তাবিধান করিব; এবং আমি ভীতি বা অনুগ্রহ, অনুরাগ বা বিরাগের বশবর্তী না হইয়া সকলের প্রতি আইন-অনুযায়ী যথাবিহিত আচরণ করিব।"
In English, "I, (name) do swear with honor (or solemnly affirm) that I, according to the laws, shall faithfully discharge the functions of the office of the Chief Justice (or Justice of the Apealate Division or High Court Division of the Supreme Court, as the circumstances allow). I shall possess pure faith and obedience to Bangladesh. I shall preserve, support and secure the constitution and the laws and I shall deal with all with equity as suggested by laws, without being affected by fear or mercy, love or hatred." The Election Commissioners, members of the Public Service Commission and the Comtroller and Auditor General takes a likely oath of office from the Chief Justice. The representatives of the people in the local government takes oath from the Prime Minister or the minister in charge of the Local Government Division. In Belgium, the King is not crowned but swears the constitutional oath in front of both Chambers of the federal parliament in the Palace of the Nation in Brussels. The assembly room is rebuilt for this occasion. First, the parliamentary session of the Federal Chamber of Representatives and the Senate is opened. The joint session is presided over by the presidents of the Chamber and the Senate. Afterwards, the King is announced by the usher in the country's three official languages: le Roi – de Koning – der König. The King enters the assembly room and sits on the throne in the center. Dutch: Ik zweer dat ik de Grondwet en de wetten van het Belgische volk zal naleven, 's Lands onafhankelijkheid handhaven en het grondgebied ongeschonden bewaren. French: Je jure d'observer la Constitution et les lois du peuple belge, de maintenir l'indépendance nationale et l'intégrité du territoire. German: Ich schwöre, die Verfassung und die Gesetze des belgischen Volkes zu beachten, die Unabhängigkeit des Landes zu erhalten und die Unversehrtheit des Staatsgebietes zu wahren. The King makes his inaugural speech. The President of the Senate congratulates the King. The Royal Band of the Belgian Naval Component performs the Belgian national anthem and the European anthem. The King leaves and the parliamentary session is closed. 101 cannon shots are fired. The prime minister, the ministers and state secretaries of the Belgian federal government swear an oath in front of the Belgian King. Also the minister-presidents of the Flemish government, of the Walloon government, of the government of the French community, of the government of the German-speaking community and of the Brussels-Capital region government swear the oath at the King. The other members of these governments do not take the oath at the King, but in front of their respective parliaments. They may choose to take the oath in one or more of the country's languages. Dutch: Ik zweer getrouwheid aan de Koning, gehoorzaamheid aan de Grondwet en aan de wetten van het Belgische volk. French: Je jure fidélité au Roi, obéissance à la Constitution et aux lois du Peuple belge. German: Ich schwöre Treue dem König, Gehorsam der Verfassung und den Gesetzen des belgisches Volkes. In English: I swear fidelity to the King, obedience to the constitution and to the law of the Belgian people. Dutch: Ik zweer de Grondwet na te leven. French: Je jure d'observer la Constitution. German: Ich schwöre, die Verfassung zu beachten. In English: I swear obedience to the constitution. All public servants in judiciary and administration, officers of the civil guards and the army and servants in general of any public office have to swear the same oath as ministers. Flemish mayors and the members of municipal executive and the city council in Flanders have following oath: "Ik zweer de verplichtingen van mijn mandaat trouw na te komen" (I swear to fulfill the duties of my office faithfully). In Walloon the following version is used: "Je jure fidélité au Roi, obéissance à la Constitution et aux lois du peuple belge." I promise to preserve, defend and uphold the Constitution, observe the Laws, promote the general welfare of the Brazilian people, and to sustain the union, the integrity and the independence of Brazil. The internal rules of the Supreme Federal Court set out the affirmation that must be taken by justices upon their investiture. Other judges make different affirmations, as provided for by law or in the internal rules of each Court. In Brunei, it is known as Oath or Declaration of Allegiance which any person in the public services may require to take if His Majesty the King and the Head of Government (Yang Di-Pertuan Negara) wishes. I, ...(name)...., swear by Almighty Allah [for Muslim] /OR/ solemnly and sincerely declare [for non Muslim], that I will be faithful and bear true allegiance to His Majesty the Sultan and Yang Di-Pertuan...(current king's name)... and His Successors according to law. That I will without fear or favour and to the best of my ability and judgment, serve as a true and faithful member of the publice service of Brunei Darussalam. No formal oath is required to be taken by the monarch. The Governor General of Canada is required to take the "Oath for the due execution of the Office of Our Governor General and Commander-in-Chief in and over Canada, and for the due impartial administration of justice", which includes swearing allegiance to the reigning Canadian monarch the viceroy is to represent. This oath must be administered by the Chief Justice of the Supreme Court of Canada or a puisne justice and, though not demanded, this is usually done during a swearing-in ceremony in the Canadian Senate chamber. I, (name), do swear (declare) that I will be faithful and bear true allegiance to Her Majesty Queen Elizabeth the Second, Queen of Canada, her heirs and successors, so help me God. I, (name), do solemnly and sincerely swear (declare) that I shall be a true and faithful servant to Her Majesty Queen Elizabeth the Second, as a member of Her Majesty’s Privy Council for Canada. I will in all things to be treated, debated and resolved in Privy Council, faithfully, honestly and truly declare my mind and my opinion. I shall keep secret all matters committed and revealed to me in this capacity, or that shall be secretly treated of in Council. Generally, in all things I shall do as a faithful and true servant ought to do for Her Majesty. So help me God. I, (name), do solemnly and sincerely promise and swear (or declare) that I will truly and faithfully, and to the best of my skill and knowledge, execute the powers and trusts reposed in me as (office), so help me God. Ministers who choose to take the oath as an affirmation use declare instead of swear and omit so help me God. After leaving Cabinet, former Ministers typically remain Privy Councillors for life, and as such retain the privilege of styling themselves "The Honourable" (or "The Right Honourable," in the case of the Prime Minister), and may use the post-nominals "P.C." On July 1, 2015, the 15th Meeting of the 12th Standing Committee of the National People's Congress passed the Decision of the National People's Congress Standing Committee Regarding the Implementation of a Constitutional Oath System, with an effective date of January 1, 2016. The Decision requires state civil servants elected or appointed by the National People's Congress, its Standing Committee, the State Council, the Central Military Commission, the Supreme People's Court, the Supreme People's Procuratorate, and other central government organs, as well as equivalent local government organs at or above the county level, to publicly swear an oath to the constitution upon formally taking office. I pledge to be loyal to the Constitution of the People's Republic of China, safeguard the authority of the Constitution, fulfill the legal responsibilities of my position, be loyal to the Motherland, be loyal to the people, show the utmost respect for my duty, pursue public affairs with integrity, accept the supervision of the people, and to work for a great modern socialist country that is prosperous, strong, democratic, culturally advanced, harmonious, and beautiful! -¿Juráis a Dios y prometéis a la Patria, observar y defender la Constitución y las leyes de la República, y cumplir fielmente los deberes de vuestro destino? -Sí, juro-. -Si así lo hiciereis, Dios os ayude, y si no, Él y la Patria os lo demanden. (Do you swear before God and promise the Country to observe and defend the Constitution and the laws of the Republic and faithfully fulfill the duties of your office?" I solemnly swear to perform the duty of the President of the Republic of Croatia conscientiously and responsibly, to the benefit of the Croatian people and all Croatian citizens. As a Head of the Croatian State, I will keep the Constitution and laws, care for the respect of the Constitutional order of the Republic of Croatia, cherish proper and fair action of all bodies of state authority and keep the independence, existence and unity of the Croatian State. So help me God! I, (name), promise and swear before almighty and all-knowing God that I will, in the fulfilment of my office, follow the constitution and other laws, acting rightfully and impartially for the sake of the citizens and the society. I, (name), promise and affirm by my honour and by my conscience that I will, in the fulfillment of my office, follow the constitution and other laws, acting rightfully and impartially. I will fulfill my duties carefully and as well as I can. Furthermore, I will not divulge to third parties knowledge which I have gained in my office, and which must be kept secret. I, (name), elected by the people of Finland as the President of the Republic, hereby affirm that in my presidential duties I shall sincerely and conscientiously observe the Constitution and the laws of the Republic, and to the best of my ability promote the wellbeing of the people of Finland. I, (name), promise and affirm before the almighty and all-knowing God (in affirmation: by my honour and by my conscience) that I am a trustworthy and faithful citizen of the realm of Finland. I want to serve my country honestly and, to my best ability, seek and pursue her edification and advantage. I want everywhere and in every situation, during the peace and during the war, defend the inviolability of my fatherland, her legal system of government and the legal authority of the realm. If I perceive or gain knowledge of activity to overthrow the legal authority or to subvert the system of government of the country, I want to report it to the authorities without delay. The troop to which I belong and my place in it I will not desert in any situation, but so long as I have strength in me, I will completely fulfill the task I have received. I promise to act properly and uprightly, obey my superiors, comply with the laws and decrees and keep the service secrets trusted in me. I want to be forthright and helpful to my fellow servicemen. Never will I due to kinship, friendship, envy, hatred or fear nor because of gifts or any other reason act contrary to my duty in service. If I be given a position of superiority, I want to be rightful to my subordinates, to take care of their wellbeing, acquire information on their wishes, to be their councillor and guide and, for my own self, set them a good and encouraging example. All this I want to fulfil according to my honour and my conscience. I swear that I will dedicate my efforts to the well-being of the German people, promote their welfare, protect them from harm, uphold and defend the Basic Law and the laws of the Federation, perform my duties conscientiously, and do justice to all. So help me God. The religious affirmation may be omitted. The first (and only) chancellor to do this was Gerhard Schröder in 1998. Each of the 16 Länder (states) has its own oath of office for the Minister Presidents and other ministers, also for the Länder employees. I swear to serve loyally the Federal Republic of Germany and to defend bravely the right and the freedom of the German people. So help me God. In both of the above, conscripts say "vow" instead of "swear", and the religious affirmation is not added for conscripts since the vow is not an actual oath. I swear in the name of the Holy Consubstantial and Indivisible Trinity to keep faith in my Country and in the democratic form of government, obedience to the Constitution and the laws and to discharge conscientiously my duties. I swear in the name of the Holy, Consubstantial and Indivisible Trinity to safeguard the Constitution and the laws, to ensure their faithful observance, to defend the national independence and territorial integrity of the Country, to protect the rights and liberties of the Greeks and to serve the general interest and the progress of the Greek People. I promise to make and to keep the political constitution of the Republic Of Guatemala and the laws that came from it, and loyally and faithfully love to my country the position of President of the Republic that the public has given me legally and legitimate, looking above all for the good and the prosperity of the country so help me God; and if I don't do it as such that the nation should demand it from me. Afterwards, the outgoing President passes him the Guatemalan flag (the Banda Presidential), which is worn from the left shoulder to the right rib, to the new President along with the presidential pin and with the Constitutional Collar. I, (name), swear that, in the office of Chief Executive of the Hong Kong Special Administrative Region of the People's Republic of China, I will uphold the Basic Law of the Hong Kong Special Administrative Region of the People's Republic of China, bear allegiance to the Hong Kong Special Administrative Region of the People's Republic of China and serve the Hong Kong Special Administrative Region conscientiously, dutifully, in full accordance with the law, honestly and with integrity, and be held accountable to the Central People's Government of the People's Republic of China and the Hong Kong Special Administrative Region. I swear that, in the office of (office) of the Government of the Hong Kong Special Administrative Region of the People's Republic of China, I will uphold the Basic Law of the Hong Kong Special Administrative Region of the People's Republic of China, bear allegiance to the Hong Kong Special Administrative Region of the People's Republic of China and serve the Hong Kong Special Administrative Region conscientiously, dutifully, in full accordance with the law, honestly and with integrity. I, (name), do swear in the name of God (or solemnly affirm) that I will faithfully execute the office of President (or discharge the functions of the President) of India, and will to the best of my ability preserve, protect and defend the Constitution and the law, and that I will devote myself to the service and well-being of the people of Republic of India. I, (name), do swear in the name of God (or solemnly affirm) that I will bear true faith and allegiance to the Constitution of India as by law established, and that I will faithfully discharge the duty upon which I am about to enter. I, (name), do swear in the name of God (or, solemnly affirm) that I will bear true faith and allegiance to the Constitution of India as by law established, that I will uphold the sovereignty and integrity of India, that I will faithfully and conscientiously discharge my duties as a Minister for the Union and that I will do right to all manner of people in accordance with the Constitution and the law, without fear or favour, affection or ill-will. I, (name), do swear in the name of God (or, solemnly affirm) that I will not directly or indirectly communicate or reveal to any person or persons any matter which shall be brought under my consideration or shall become known to me as a Minister for the Union except as may be required for the due discharge of my duties as such Minister. I, (name), having been appointed Chief Justice (or a Judge) of the Supreme Court of India, do swear in the name of God (or affirm) that I will bear true faith and allegiance to the Constitution of India as by law established, that I will uphold the sovereignty and integrity of India, that I will duly and faithfully and to the best of my ability, knowledge and judgment perform the duties of my office without fear or favour, affection or ill-will and that I will uphold the Constitution and the laws. In the name of Allah, I swear that I will perform the duties of the President (or Vice-President) of the Republic of Indonesia to the best of my ability and as justly as possible, and that I will strictly observe the Constitution and consistently implement the law and regulations in the service of the country and the people. I solemnly promise that I will perform the duties of the President (or Vice-President) of the Republic of Indonesia to the best of my ability and as justly as possible, and that I will strictly observe the constitution and consistently implement the law and regulations in the service of the country and the people. In case any sessions can not be held, like one in 1998 when the protesters took control of the parliament building, the oath can be performed before the MPR chairperson and vice chairpersons, as well as the Chief Justice and his/her deputies with presence of the chairperson of every chambers. that I, being appointed to this office, directly or indirectly, by any name or excuse, will not grant or promise or give something to anyone. That I, for doing or not doing something, will never receive from anyone, directly or indirectly, any promise or givings. That I, will be faithful to the Constitution and will preserve any laws and rulings that valid for the state of the Republic of Indonesia. That I, with all my strength, will seek the welfare of the Republic of Indonesia. That I will be faithful to the people and the country, and will fulfill any obligations that were passed on me because of this office. That I will execute the duties and obligations with full responsibility to the people and the country. To refer the god in Hindu, the oath used to use sentence "In the name of Sang Hyang Widhi", and later "Om Swastiastu". There was also a time when Christian and Catholic ministers said "I swear" instead of promise at the beginning of the oath, did not mention any reference to God. The verses "to seek the welfare" was removed since it reflected the dictatorial New Order era. I, as a judge, in the presence of the Holy Qur'an and before Iranian nation, swear to omnipotent God to follow the Prophet of Islam and the sacred Imams, peace be upon them, and seeking help of the spirits of the martyrs of Islam, guard justice and righteous, and undertake upon my human dignity to be diligent in seeking the truth and justice, administer Islamic justice to demand from oppressor and restore it to its owner and with sustained effort in Judicial position fulfill my obligation to Islamic republic with strengthening the foundations of the Islamic republic and supporting The Leader. The Constitution of Ireland specifies, for each of three offices, a "declaration" which the holder must "make and subscribe" before taking office. President ...maintain the Constitution of Ireland and uphold its laws, that I will fulfil my duties faithfully and conscientiously in accordance with the Constitution and the law, and that I will dedicate my abilities to the service and welfare of the people of Ireland. May God direct and sustain me. Member of the Council of State ...faithfully and conscientiously fulfil my duties as a member of the Council of State. Judge ...duly and faithfully and to the best of my knowledge and power execute the office of (office) without fear or favour, affection or ill-will towards any man, and that I will uphold the Constitution and the laws. May God direct and sustain me. The declarations' references to God were criticised in a 1993 report of the United Nations Human Rights Committee. The 1996 Constitution Review Group proposed that the President and members of the Council of State should be permitted to substitute a non-religious affirmation. In contrast, it recommended a uniform non-religious oath for all judges, on the basis that impartiality was more central to the judicial function and would be compromised by providing a choice of words. The "solemn declaration" for members of the Garda Síochána was revised in 2005. Its reference to God may be omitted. Members pledge not to "belong to or subscribe to, any political party or secret society whatsoever". In the Defence Forces, the "Oath or Declaration" differs between permanent and reserve forces, and between commissioned officers and enlisted members. The wording makes no reference to God; it was changed in 1979 when women were first admitted. Members of the Oireachtas and of the Government do not make any oath. From the foundation of the Irish Free State in 1922, both had to make an oath of allegiance to the Constitution and of fidelity to King George V. This controversial provision of the 1921 Anglo-Irish Treaty contributed to the Civil War of 1922–23. The Oath was abolished by Fianna Fáil in 1932–33. Since then, Oireachtas members are required by standing orders to sign the roll before first taking their seats. The Governor-General of the Irish Free State took the same Oath of Allegiance and Oath of Office as the Governor General of Canada. This did not take place in public. Oldest member of Knesset or chairperson: I pledge myself to bear allegiance to the State of Israel and faithfully to discharge my mandate in the Knesset. Each other member of the Knesset, in turn: I pledge myself. I, (name), pledge myself as a member of the Government to bear allegiance to the State of Israel and to its laws, to carry out faithfully my functions as a member of the Government and to comply with the decisions of the Knesset. Giuro di essere fedele alla Repubblica e di osservarne lealmente la Costituzione. Giuro di essere fedele alla Repubblica, di osservarne lealmente la Costituzione e le leggi, e di esercitare le mie funzioni nell'interesse esclusivo della Nazione. I swear to be faithful to the Republic, to loyally observe its Constitution and laws, and to exercise my functions in the exclusive interest of the Nation. I swear by Almighty God to observe the Constitution and the Laws of the Lebanese Nation and to maintain the independence of Lebanon and its territorial integrity. I swear to observe the Constitution and the laws of the Grand Duchy of Luxembourg, to maintain the national independence and integrity of the territory, as well as public and individual liberties. I swear to be faithful to the Grand Duke; I swear to observe the Constitution and the laws of the country. A Lieutenant of the Grand Duke takes an oath to respect the Constitution, but no exact text is prescribed. I swear to be faithful to the Grand Duke and to obey the Constitution and the laws of the State. I swear allegiance to the Grand Duke and obedience to the Constitution and the laws of the State. I promise to fulfill my duties with integrity, exactitude, and impartiality. Article 37 of the Federal Constitution requires the Yang di-Pertuan Agong (King) and his deputy to take the Oath of Office before the Conference of Rulers. We, (name), Yang di-Pertuan Agong of Malaysia do hereby swear Wallahi; Wabillahi; Watallahi (in Allah's name) and by virtue of that oath do solemnly and truly declare that we shall justify and faithfully perform/carry out our duties in the administration of Malaysia in accordance with its laws and Constitution which have been promulgated or which may be promulgated from time to time in the future. Further we do solemnly and truly declare that we shall at all time protect the religion of Islam and uphold the rules of law and order in the Nation. We, (name), being elected to be Timbalan Yang di-Pertuan Agong (Deputy King) of Malaysia do hereby swear Wallahi; Wabillahi; Watallahi (in Allah's name) and by virtue of that oath do solemnly and truly declare that we shall faithfully perform/carry out our duties as Timbalan Yang di-Pertuan Agong as laid down and as may from time to time be laid down by the laws and the Constitution of Malaysia. I, (name), having been elected/appointed to the office of (office) do solemnly swear/affirm that I will faithfully discharge the duties of that office to the best of my ability, that I will bear true faith and allegiance to Malaysia and will preserve, protect and defend the Constitution. I, (name), having been elected/appointed as a Member of the House of Representatives/the Senate do solemnly swear/affirm that I will faithfully discharge my duties as such to the best of my ability, that I will bear true faith and allegiance to Malaysia and will preserve, protect and defend the Constitution. I, (name), having been elected/appointed to the office of (office) do solemnly swear/affirm that I will faithfully discharge my judicial duties in that office to the best of my ability, that I will bear true faith and allegiance to Malaysia and will preserve, protect and defend the Constitution. I promise to make and to keep the political constitution of the United Mexican States and the laws that from it derive, and with loyalty and patriotism the position of President of the Republic that the people has given me, looking above all for the good and the prosperity of the Union; and if I don't, the nation should demand it from me. Afterwards, the outgoing President passes him the presidential sash (the Banda Presidential), which is worn from the left shoulder to the right rib, to the new President. I solemnly swear to devote all my personal strength and abilities to the prosperity of the Republic of Moldova, to abide by the Constitution and the laws of the country, to defend democracy, fundamental human rights and freedoms, the sovereignty, independence, unity and territorial integrity of Moldova. We swear (affirm) that we will do everything that good and true States General, States of Aruba, States of Curaçao and States of Saint Martin should do. I swear (or declare) that in order to be appointed minister / state secretary / member of the States General, I have not promised or given, directly or indirectly, any gifts or presents to any person under whatsoever name or pretext. I swear (or declare and affirm) that in order to do or refrain from doing anything whatsoever in this office, I have not accepted and will not accept, directly or indirectly, any promises or presents from anyone whomsoever. I swear (or affirm) allegiance to the King, to the Statute for the Kingdom and to the Constitution. I swear (or affirm) that I will faithfully perform all the duties which the office lays upon me. I swear (or affirm) that I will behave as a good civil servant should do, that I will be careful, honest and reliable and that I will do nothing that harms the prestige of the office. I, [name], swear that, as Governor-General and Commander-in-Chief of the Realm of New Zealand, comprising New Zealand; the self-governing states of the Cook Islands and Niue; Tokelau; and the Ross Dependency, I will faithfully and impartially serve Her [or His] Majesty [specify the name of the reigning Sovereign, as thus: Queen Elizabeth the Second], Queen of New Zealand [or King of New Zealand], Her [or His] heirs and successors, and the people of the Realm of New Zealand, in accordance with their respective laws and customs. So help me God. An affirmation may be used instead of this oath. I promise and swear that I will govern the Kingdom of Norway in accordance with its Constitution and Laws; so help me God, the Almighty and Omniscient. I, (name) of (Hometown), having been elected and proclaimed as President of the Philippines, do solemnly swear (or affirm) that I will faithfully and conscientiously fulfill my duties as President (or Vice-President or Acting President) of the Philippines, preserve and defend its Constitution, execute its laws, do justice to every man, and consecrate myself to the service of the Nation. So help me God." [In case of affirmation, last sentence will be omitted]. I, (name), do solemnly swear (or affirm) that I will faithfully and conscientiously fulfill my duties as President (or Vice-President or Acting President) of the Philippines, preserve and defend its fundamental law, execute its just laws, do justice to every man, and consecrate myself to the service of the Nation. So help me God." [In case of affirmation, last sentence will be omitted]. I, (name) of (Residence), having been elected/appointed to the position of (office), do hereby solemnly swear that I will well and faithfully discharge to the best of my ability, the duties of my present position and of all others I may hereafter hold, under the Republic of the Philippines, that I will support and defend the Constitution of the Philippines, that I will bear true faith and allegiance to the same, that I will obey the laws, legal orders and decrees, promulgated by the duly constituted authorities of the Republic of the Philippines, and that I impose this obligation upon myself, voluntarily, without mental reservation or purpose of evasion. So Help me God. If done for personnel of the Armed Forces of the Philippines, instead of legal orders/mga katususang legal, the phrase lawful orders/mga utos na ayon sa batas is used. Assuming this office of Prime Minister (or Deputy Prime Minister or minister), I do solemnly swear to be faithful to the provisions of the Constitution and other laws of the Republic of Poland, and that the good of the Homeland and the prosperity of its citizens shall forever remain my supreme obligation. I swear by my honour to faithfully perform the functions in which I am invested and to defend and observe the Constitution of the Portuguese Republic and cause it to be observed. I solemnly swear that I will dedicate all my strength and the best of my abilities for the spiritual and material welfare of the Romanian people, to abide by the Constitution and laws of the country, to defend democracy, the fundamental rights and freedoms of my fellow citizens, Romania's sovereignty, independence, unity and territorial integrity. So help me God! Article 32 of the Law 215 (23 April 2001) provides that all local officials (Local Councilors, Mayors, County Councilors and County Council Presidents), before the assembled Councils and the Prefect of the County, give, in Romanian the following oath. I solemnly swear to abide by the Constitution and laws of the country, and in good faith, to dedicate all my strength and the best of my abilities for the good of the citizens of the commune (city, municipality or county)___. So help me God! Romanian: Jur să respect Constituţia şi legile ţării şi să fac, cu bună-credinţă, tot ceea ce stă în puterile şi priceperea mea pentru binele locuitorilor comunei (oraşului, municipiului, judeţului)... Aşa să-mi ajute Dumnezeu! The religious formula may be omitted. During the Coronation of the Russian monarch, after his anointing, but prior to partaking of Holy Communion, the Tsar recited a coronation oath, in which he swore to preserve the autocracy intact and to rule his realm with justice and fairness. I, (name), having been appointed to the office of Prime Minister, do solemnly swear (or affirm) that I will bear true faith and allegiance to the Republic of Singapore, and that I will preserve, protect and defend the Constitution of the Republic of Singapore. I, (name), being chosen and appointed Prime Minister of Singapore, do solemnly swear (or affirm) that I will at all times faithfully discharge my duties as Prime Minister, according to law, to the best of my knowledge and ability, and without fear or favour, affection or ill-will. I, (name), having been appointed to the office of Minister, do solemnly swear (or affirm) that I will bear true faith and allegiance to the Republic of Singapore, and that I will preserve, protect and defend the Constitution of the Republic of Singapore. I, (name), being chosen as Minister of Singapore, do solemnly swear (or affirm) that I will at all times faithfully discharge my duties as Minister according to law, and to the best of my knowledge and ability, without fear or favour, affection or ill-will. Giving praise and reverence to Almighty God, Blessed Mary ever Virgin, Blessed Marino, Patron and defender of the Commune and the People of this Land, and of its curia, District and Peasantry, You, Captains Regent, called and elected to govern the Republic for the six months ahead starting from today, and to continue and finish happily, by putting your hands on the holy Gospels of God, you swear that you will always preserve the Republic and its empire, freedom, dignity, privileges, exemptions and any other right, with your eyes, soul, thoughts and care, and that your mind will only be centred on public good. With all your strength, you will promote peace and harmony among citizens, of which there is nothing more healthy in a free City; day and night, you will be the most vigilant custodians of this Land and you will care to observe and enforce the Statutes, laws and decrees of this Land, both existing and to be drawn up, and, in default of them, the praiseworthy customs of the People. You will be favourable and benign defenders of widows, orphans, children and poor people, as well as of Churches, Hospitals and other venerable places, as well as of property, and of their rights. Constantly, at the usual times during your office, you will sit on your usual Throne to adopt decisions that are equal for all, and you will always act in a way that you judge will be good for the Republic and its citizens. I swear to faithfully execute my duties, obey and enforce the Constitution and the laws, to respect the rights of the citizens and of the Autonomous Communities. In an inauguration ceremony a new Spanish Prime Minister takes an oath or affirmation of office over an open Constitution, which may be next to a cross and a Bible, and before the King of Spain and other dignitaries. Other ministers take a similar oath. I, (name), promise and affirm on my honour and conscience that I will and shall impartially, as to the rich as well as to the poor, administer justice in all matters to the best of my ability and conscience, and judge according to the law of the Realm of Sweden; that I will never manipulate the law or further injustice for kinship, relation by marriage, friendship, envy, ill-will, or fear, nor for bribes or gifts, or any other cause in whatever guise it may appear; nor will I declare guilty one who is innocent, or innocent one who is guilty. Neither before nor after the pronouncement of the judgment of the court shall I disclose to the litigants or to other persons the in camera deliberations of the court. All this, as a honest and righteous judge, I will and shall faithfully observe. Elisabeth Kopp's oath of office after her election at the Swiss Federal Council in 1984. In Switzerland, according to the Federal Act on the Federal Assembly, people elected at the Swiss Federal Assembly or elected by it (such as the Swiss Federal Council) have to take an oath in front of the assembly. I swear by Almighty God to uphold the Constitution and the law and to fulfil the duties of my office to the best of my abilities. I solemnly promise to uphold the Constitution and the law and to fulfil the duties of my office to the best of my abilities. To serve my nation and republic in times of war and peace with integrity and affection, on land, on the sea, and in the air, To abide by all rules and regulations and to obey my superiors, To value more than my life, the honor of service and the reputation of the Turkish Flag, And if necessary, to willingly give up my life in the name of duty, homeland, and republic. In the United Kingdom, no formal oath is essential to be taken by the monarch in relation to his or her accession. He or she is, however, required to take an oath regarding the security of the Church of Scotland. At a coronation, the monarch usually takes an oath but as a coronation is inessential, Monarchs need not take a similar oath in order to discharge their duties, as with the case of Edward VIII. The exact wording of the coronation oath of various monarchs has altered throughout the years without statutory authority but remain based on the oath as prescribed by the Coronation Oath Act 1688. I, [Name], by the Grace of God of the United Kingdom of Great Britain and Northern Ireland and of My other Realms and Territories Queen, Defender of the Faith,[dubious – discuss] do faithfully promise and swear that I shall inviolably maintain and preserve the Settlement of the true Protestant Religion as established by the Laws made in Scotland in prosecution of the Claim of Right and particularly by an Act entitled ‘An Act for securing the Protestant Religion and Presbyterian Church Government’ and by the Acts passed in the Parliament of both Kingdoms for Union of the two Kingdoms, together with the Government, Worship, Discipline, Rights and Privileges of the Church of Scotland. A general Oath of Allegiance and Official Oath, are set out in the Promissory Oaths Act 1868 are required to be taken by various office-holders. I, (name), do swear that I will be faithful and bear true allegiance to Her Majesty Queen Elizabeth, her heirs and successors, according to law. So help me God. I, (name), do swear that I will well and truly serve Her Majesty Queen Elizabeth in the office of (office). So help me God. I, (name), do swear by Almighty God that I will well and truly serve our Sovereign Lady Queen Elizabeth in the office of (office), and I will do right to all manner of people after the laws and usages of this realm (or colony), without fear or favour, affection or ill will. Those choosing affirm simply replace "do swear by Almighty God" with "solemnly sincerely and truly declare and affirm"
I, (name), do swear that I will well and faithfully serve in the office of (office), etc. I, (name), do solemnly and sincerely and truly affirm and declare that I will well and faithfully serve in the office of (office), etc. I... swear by Almighty God (do solemnly, and truly declare and affirm) that I will be faithful and bear true allegiance to Her Majesty Queen Elizabeth II, Her Heirs and Successors, and that I will, as in duty bound, honestly and faithfully defend Her Majesty, Her Heirs and Successors, in Person, Crown and Dignity against all enemies, and will observe and obey all orders of Her Majesty, Her Heirs and Successors, and of the generals (admirals / air officers) and officers set over me. Privy Counsellors take office on being "sworn of the Privy Council". It was formerly regarded as criminal to disclose the form of Privy Council oath, which includes an undertaking of secrecy as to the proceedings in Council (where the Oath is taken). On 28 July 1964 it was published by the President of the Council in answer to a written parliamentary question. "I hereby do solemnly and sincerely and truly declare and affirm that I will faithfully discharge the duties of the office of constable." "I, (name), do solemnly swear (or affirm) that I will faithfully execute the Office of President of the United States, and will to the best of my Ability, preserve, protect and defend the Constitution of the United States." The oath may be sworn or affirmed (in which case it is called an affirmation instead of oath). Although not present in the text of the Constitution, it is customary for modern presidents to say "So help me God" after the end of the oath. For officers other than the President, the expression "So help me God" is explicitly prescribed, but the Judiciary Act of 1789 also explains when it can be omitted (specifically for oaths taken by court clerks): "Which words, so help me God, shall be omitted in all cases where an affirmation is admitted instead of an oath." This oath is also taken by the Vice President, members of the Cabinet, federal judges and all other civil and military officers and federal employees other than the President. I solemnly swear (or affirm) that I will support the Constitution of the United States, and the Constitution of the State of New York, (and the Charter of the City of New York, e.g. ), and that I will faithfully discharge the duties of the office of (mayor of the City of New York, e.g.) to the best of my ability. I do solemnly swear that I will perform with fidelity the duties of the office to which I have been elected, and which I am about to assume. I do solemnly swear to support the constitutions of Tennessee and the United States and to faithfully perform the duties of the office of ____________ for ____________ County, Tennessee. the constitutions of Tennessee and the United States and to faithfully perform the duties of the office of county commissioner representing the ____________ district of ____________ County, Tennessee. Clerks of court, deputy clerks of court, sheriffs, deputy sheriffs, assessors of property and deputy assessors, constables with law enforcement powers, constables without law enforcement powers, general sessions court judges, and school board members in Tennessee all have specific variations of their oaths of office. Before God and the Fatherland, Do you swear therefore to perform the duties of the position of Constitutional President of the Bolivarian Republic of Venezuela, and in the performance of your duties fulfill the Constitution and laws of the Republic? With the right hand on the shoulder level he answers with a "Yes I swear" and the President then responds: "If you do so, before God and the Fatherland your duties will be performed, and it will be demanded of you if you not. Therefore, in the name of the Republic and by the authority of the law, I investiture you as Constitutional President of the Republic as of this moment for this term period." Then the Presidential Sash (with the colors and coat of arms from the Flag of Venezuela and the collar of the Order of the Liberatiors is turned over to him from the outgoing President, but if the case is that of succession due to death of office of his predecessor both items are cased and are given to him by the National Assembly President instead. If reelected the method is the same as after the sudden death of the President while in office. I believe in one God, the Father, the Almighty, of heaven and earth, of all that is seen and unseen. I believe in one Lord, Jesus Christ, the only Son of God, eternally begotten of the Father, God from God, Light from Light, true God from true God, begotten not made, one in Being with the Father. Through him all things were made. For us men and for our salvation, he came down from heaven: by the power of the Holy Spirit he became incarnate of the Virgin Mary, and became man. For our sake he was crucified under Pontius Pilate; he suffered death and was buried. On the third day he rose again in accordance with the Scriptures; he ascended into heaven and is seated at the right hand of the Father. He will come again in glory to judge the living and the dead, and his kingdom will have no end. I believe in the Holy Spirit, the Lord, the giver of life, who proceeds from the Father and the Son. With the Father and the Son he is worshiped and glorified. He has spoken through the Prophets. I believe in one holy catholic and apostolic Church. I acknowledge one baptism for the forgiveness of sins. I look forward to resurrection of the dead, and the life of the world to come. Amen. I, (name), in assuming the office of (office), promise that in my words and in my actions I shall always preserve communion with the Catholic Church. ^ Commonwealth of Australia Constitution Act. Commonwealth of Australia. 1900. pp. Chapter I, Part IV, clause 42. ^ "Oath of Office". Office of the Official Secretary to the Governor-General. Retrieved 18 September 2013. ^ "PM Abbott sworn in on royal oath". Irish Echo. 18 September 2013. Retrieved 18 September 2013. ^ "পাতা:গণপ্রজাতন্ত্রী বাংলাদেশের সংবিধান.djvu/৯২ - উইকিসংকলন একটি মুক্ত পাঠাগার". bn.wikisource.org (in Bengali). Retrieved 2017-02-27. ^ "The official internet-portal of the President of the Republic of Belarus/Status". President.gov.by. 1998-05-11. Retrieved 2010-09-22. ^ "Official Oaths". Governor General of Canada. Retrieved 9 April 2019. ^ "Oaths of Office". Queen's Printer for Canada. 30 April 2009. Retrieved 22 September 2010. ^ "Queen's Privy Council for Canada". Government of Canada. ^ "我国通过宪法宣誓制度". 人民网. 新华社. 2015-07-02. Retrieved 2015-10-08. ^ Article 194 of the Constitution of Costa Rica, costaricalaw.com. ^ Code of judicial procedure (4/1734), 1st Chapter, section 7. Retrieved 1-9-2008. ^ a b c d e Oaths and Declarations (Amendment) Bill 1997, legco.gov.hk. ^ Pratiyogita Darpan (October 2007). Pratiyogita Darpan. Pratiyogita Darpan. p. 67. Retrieved 31 May 2012. ^ "Oath of judges in Iran". Stop.torturing.us. 2010-07-17. Retrieved 2010-09-22. ^ a b c Constitution Review Group (July 1996). "Report" (PDF). Dublin: Stationery Office. pp. 26, 113, 157. Archived from the original (PDF) on 21 July 2011. Retrieved 7 March 2011. ^ Section 16, Garda Síochána Act 2005 Irish Statute Book. ^ Section 6, Defence (Amendment) (No. 2) Act, 1979 Irish Statute Book. ^ Knesset website, "Basic Law: The Knesset - 1958"
^ a b Knesset website, "Basic Law: The Government - 1968 (Original Version)", point 16, "Declaration of allegiance". ^ "Swearing in of President Mattarella". La Repubblica newspaper. 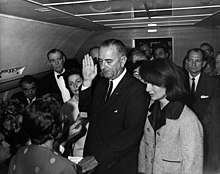 ^ "Swearing in of the Government". The official website of the Government of the Italian Republic. ^ "The Lebanese Constitution" (PDF). May 23, 1926. Retrieved 2018-02-14. ^ Prof. Dr. Axel Tschentscher, LL.M. "ICL - Luxembourg - Constitution". Servat.unibe.ch. Retrieved 2010-09-22. ^ "Oath of the President". Presidency of the Republic of Moldova. Retrieved 2018-02-04. ^ "Appendix A: Letters Patent Constituting the Office of Governor-General of New Zealand 1983". Cabinet Manual. Cabinet Office; Department of the Prime Minister and Cabinet; Wellington, New Zealand. 2008. ^ "ANG 1987 KONSTITUSYON NG REPUBLIKA NG PILIPINAS". Center for Southeast Asian Studies, Northern Illinois University. ^ "Aquino takes oath as 15th Philippine president". GMA News. June 30, 2010. ^ "REPUBLIC ACT NO. 6733 : AN ACT TO AMEND SECTION 21, TITLE I, BOOK I OF THE REVISED ADMINISTRATIVE CODE OF 1987, GRANTING MEMBERS OF BOTH HOUSES OF THE CONGRESS OF THE". ChanRobles Law Library. ^ "Chapter V, The Constitution of the Republic of Poland". Sejm.gov.pl. Retrieved 2010-09-22. ^ "Chapter VI, The Constitution of the Republic of Poland". Sejm.gov.pl. Retrieved 2010-09-22. ^ "Chapter IV, The Constitution of the Republic of Poland". Sejm.gov.pl. Retrieved 2010-09-22. ^ a b "Chapter 4. The President of the Russian Federation | The Constitution of the Russian Federation". Constitution.ru. Retrieved 2010-09-22. ^ R. Monk Zachariah (Liebmann), "Martyrology of the Communist Yoke: The Life of Tsar-Martyr Nicholas II", The Orthodox Word, 153 (1990), pg. 200. At The Royal Passion-Bearer: Tsar-Martyr Nicholas Alexandrovich Romanov II, pg. 4. Retrieved on 2010-01-01. ^ "Constitution of the Republic of Singapore - Singapore Statutes Online". sso.agc.gov.sg. Retrieved 2018-12-20. ^ "ds_engelsk.PDF" (PDF). Retrieved 2010-09-22. ^ a b c Federal Act on the Federal Assembly, Federal Chancellery of Switzerland (page visited on 28 March 2016). ^ "CONSTITUTION OF THE REPUBLIC OF TURKEY" (PDF). ^ "Inauguration of Yushchenko will be conducted in the Rada and on Maidan" (in Russian). News.ru. January 23, 2005. Retrieved 2009-02-16. ^ "Article 103". Constitution of Ukraine. Wikisource. Retrieved 2008-12-13. ^ "Coronation Oath, 2 June 1953". Archived from the original on May 10, 2013. Retrieved May 22, 2013. ^ "The National Assembly for Wales (Oath of Allegiance in Welsh) Order 1999". Opsi.gov.uk. 2010-07-16. Retrieved 2010-09-22. ^ "oaths". Judicial Office. Retrieved 2012-04-07. ^ "Justice (Northern Ireland) Act 2002". Opsi.gov.uk. Retrieved 2010-09-22. ^ Chap. I. 1 Stat. 23 from "A Century of Lawmaking for a New Nation: U. S. Congressional Documents and Debates, 1774 - 1875". Library of Congress, Law Library of Congress. Retrieved March 24, 2012. ^ Chap. CXXVIII. 12 Stat. 502 from "A Century of Lawmaking for a New Nation: U. S. Congressional Documents and Debates, 1774 - 1875". Library of Congress, Law Library of Congress. Retrieved March 24, 2012. ^ Chap. CXXXIX. 15 Stat. 85 from "A Century of Lawmaking for a New Nation: U. S. Congressional Documents and Debates, 1774 - 1875". Library of Congress, Law Library of Congress. Retrieved March 24, 2012. ^ Article II - The Executive Branch : Section 1 - The President, The Constitution of the United States. ^ 5 U.S.C. § 3331, Oath of Office. Wikimedia Commons has media related to Oath of office. Steve Sheppard, What Oaths Meant to the Framers' Generation: A Preliminary Sketch, 2009 Cardozo L. Rev. De Novo 273.